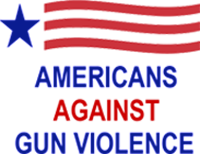 Americans Against Gun Violence was founded in March of 2016 by a group of us who were frustrated by the fact that despite repeated mass shootings and an ongoing epidemic of gun violence that claims over 90 lives a day in the United States, we couldn’t find any other organization in the entire country that openly advocates the adoption of definitive gun control laws comparable to the laws already in place in every other high income democratic nation of the world – countries in which mass shootings are rare or non-existent and in which overall rates of gun violence are much lower than in the USA. We founded Americans Against Gun Violence based upon our conviction that the American people have not only the ability, but also the moral responsibility, to reduce rates of gun violence in the United States to levels at or below those in other high income democratic countries, and that in order to do so, we must adopt comparable gun control regulations. The President of Americans Against Gun Violence, Dr. Bill Durston, is a retired emergency physician as well as a former expert marksman in the United States Marine Corps, decorated for “courage under fire” during the Vietnam War. Dr. Durston and the other members of the Board of Directors of Americans Against Gun Violence all volunteer their time, and all have extensive experience in grass roots organizing. In the short time since we founded Americans Against Gun Violence, there’s been a gratifying response from other members of the American public looking for an organization that will work toward definitive measures to stop gun violence in our country.